I am not sure what general reaction you would get from people if you told them you were crying after reading a 'comic'. Having just read the most draining, dramatic and tragic comic book I have ever experienced, I have no qualms in admitting that I cried. Sadness is imbued in every panel of this amazing issue. There are some scenes that make your heart race. You feel anger and pain and ultimately sorrow. If this was given the cinema treatment, you can imagine the action happening in slow motion, with 'Barbers Adagio for Strings' swelling up in the background. Without the added pathos, this comic gives you the horror and pointlessness of violence with no frills. It makes you confront what people do to each other. People kill each other. People do hideous and evil things for reasons that we do not really understand. People can be duped into doing these evil acts. People get hurt and get killed. People fight to gain something and find that they question why they are fighting, and ultimately there are no victors. The prize that had been fought over can be tarnished or destroyed by the violence of man. 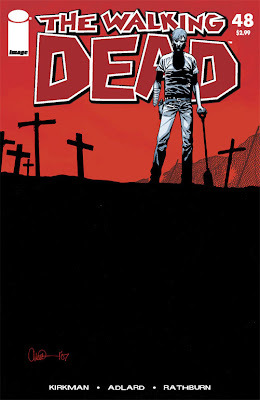 In a typical Kirkman dramatic convention, all is not what it seems after last issues cliffhanger. Once that scene is out of the way, we are pitched into 20 pages of the most intense comic drama you will ever read. Seriously, I know that the comic industry trades on hyperbole, but I doubt that I will ever read a more shocking series of pages. Death occurs on virtually every page, and 'no-one is safe'. Kirkman certainly lives up to his word. Characters you cared for, you had followed for the duration, are brutally cut down. I felt quite numb as the body count piled up. There are some heart-breaking scenes, and in particular there are scenes of fathers and sons that are incredibly moving. Kirkman really finishes off this story arc. There is a feeling of resolution about this series of issues, as if the creative team needed to clear the decks and begin again. The series is about to take on a whole different perspective. Kirkman mentioned in issue 47 that the team were very excited about what was coming up, and once you read this work, you will understand why he is enthusing. The final page of this extraordinary comic leaves us with a scene that I believe is the essence of this whole series. The end of this issue brings no cliffhanger, just a picture of people cherishing what time they have together, bonded by blood, sadness, joy, need, whatever. In the brutal world Robert Kirkman has created, life is cheap, which only intensifies that need to hold dear every moment you have with those you love. Verdict - Can a Comic Book make you cry? This one can. Probably the greatest single issue comic I will ever read. Perfection. 10 out of 10. Perfect review that sums up how I feel after just reading the tpb. Heart breaking and powerful.